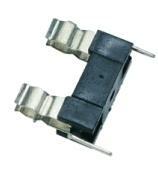 Pcb mounting fuse holder for on board fuses. High grade polyamide body, brass solder tags. Permissible Temp. For Soldering: 270 Deg. C for 5 seconds max. Contact Resistance (Initial): 10 m Ohms max. App. Weight(Gm): 2.5 gm .